Browse > Home / News / The P.M., the U.N. and the M.E. The P.M., the U.N. and the M.E. The international community must also unite in guarding against proliferation of weapons of mass destruction. It is now six years since the Security Council first expressed concern about Iran’s nuclear program. Iran still refuses to take the urgent steps necessary to build confidence that its nuclear program is exclusively peaceful. In contravention of successive IAEA and UN Security Council resolutions, Iran moves closer to having the capacity to produce weapons-grade material. So we stand with the world, united in sending a strong signal – through Security Council sanctions – that Iran must change its behaviour now. A nuclear armed Iran would be a major threat to regional and global security: especially given the shocking and aggressive statements about Israel by Iran’s leadership. There remains the opportunity for diplomacy, backed up by robust sanctions, to persuade Iran to change its course. Iran must take this opportunity for change and the nations of this Assembly must press Iran to do so. There must also be change in the Middle East process for peace. Australia shares the frustration of the parties at the current impasse. We understand the strong desire of the Palestinian people for national self-determination. Australia is resolutely committed to the establishment of a Palestinian state which is both independent and viable. This is why we provide significant support to the foundations of a future Palestinian state and build its infrastructure and economy – more than $300m in aid from 2011 to 2016. We commend the genuine progress President Abbas and Prime Minister Fayyad have made in building the institutions and infrastructure for statehood. And no one can doubt Australia’s close and continuing friendship with Israel. Our support for the right of Israel and its people to exist in security and peace is an historic commitment in Australian policy and it will endure. We urge a return to direct negotiations – the only durable basis for achieving a two-state solution. The present impasse must be overcome. Both sides need to make compromises – and avoid provocations. It will take sacrifice on both sides to settle complex and difficult issues such as settlements, borders, security and Jerusalem. The Israeli and Palestinian people deserve no less. 2) Julia’s call for the resumpition of negotiations, the need to make concessions and avoid provocations is hypocritical. The PA breaks its obligations to negotiate, it has NEVER (!!!) compromised on anything and its actions are always provocative. This false equivalence means that her government’s policy is anti-Israel, her personal sympathy notwithstanding. 3) praising the PA for state-building is utterly hollow; the PA has done nothing, NOTHING, to set up state institutions. It exists on the charity of the West and Israel (the PA owes Israel some $300m for electricity alone) because its mohammedan brothers ever ready to call for shahids are somewhat chary when it comes to shekels. Who said Labour or Liberal has abandoned Israel. I recognise we are a minority. Critisizing Labour by using the State of Israel is unhelpful to us and untrue.Lets leave party politics to local issues. ….and dismantle, get rid of the Department for Foreign Affairs, including, of course, the Minister ! 120,000 Jews in Australia verses 500,000+ Muslems. The Libs would be saying the same if in the same position.We may not like the comments but at least we should live in the real world. Really, so, as the Libs have had their chances to express views on Israel, and a former Prime Minister in John Howard, why don’t you, Noah, mate, enlighten us with some relevant quotes of Libs abandoning Israel !!!! A two state solution requires TWO parties commited to peace. A negotiation means agreeing to a middle ground. The Palestinians have said again and again that they want Israel destroyed. They have said again and again that any agreements are ONLY in preperation for the ultimate destruction of Israel. And since the international community, again and again, has stepped in on the Palestinian side, why should they compromise! A definition of “insanity” is doing the same thing over and over and expecting a different result! Jew from the USA. Thankyou Shirlee; Far to many western Jews take their freedoms fo granted. This has not been the historical norm. It is also largely illusion. If you’ve been following events in Europe, Jews have been murdered in France and attacked in Germany. The cowardly (IMHO) response by the Chief Rabbi in Berlin, “stop wearing kipot”. Here in the USA it is becoming increasingly dangerous to wear a Star of David or Chai. We must never forget that we Jews are a tiny minority in every nation but Israel. And as such, are always at the mercy of the majority and the state. It is also why ALL Jews must ALWAYS support Israel. If you disagree with Israeli policies you can join organizations that work for that change. We’ve seen far to many Jews, including Israelis, mostly from the far left actively working to undermine the State of Israel! A vote for the Left, in Australia, in the US and globally is a vote for a jewish holocaust mark II. Julia is tilting at windmills…. I don’t think she was taken seriously. I am no fan of the P.M – but all in all – her speech was not too bad. 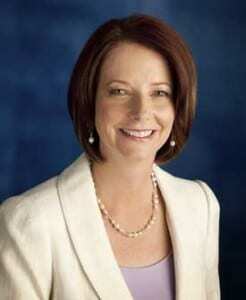 If it wasn’t so serious it would be funny to watch Gillard and Carr strut the world making a fool of Us. It’s hard to to compare the treatment of israel under the Liberals and Labour .Can we ever imagine Howard, Costello and Downer ever groveling to the African/ Muslim block to get their dammed seat at the UN security council. Israel is looking more and more isolated under a’ Ubama’ lead America with 75% or more American Jews following him like a lot of groupies, caring less and less what happens to Israel. Now we have a worrying situation in Australia where we once voted along side Israel at the UN under the Libs , then we started to sit on the fence under Labour now I am hearing from sources connected with the Muslim/ Arab community they are expecting Australia to eventually start voting against Israel and with the rest of the International community that supports the Palestinians. Is this country so desperate for a seat on the UN,that our ‘not so esteemed PM’ makes such a speech. Words like ” diplomacy and Iran” in the same sentence? What a joke! This is about kowtowing to the Arab/Middle East/Muslim countries that run amok at the UN. Yes, tilted toward a palestinian version and partial, conditional support for what Israel regards as its own agenda, including as she said, Jerusalem, which is NOT on the Israeli side of the table, not to mention the enormity of aid/bribe ot 300 million to one of the most corrupt regimes. But how would she know ! !